In the glass bangle factories of Firozabad, Uttar Pradesh, there are no lunch breaks; furnaces keep burning. The factories are filthy, the condition of workers miserable, and accidents are common. These findings, among others, are mentioned in Welfare of Glass and Bangle Workers of Firozabad, a report by a Parliamentary standing committee on labour, presented to the Lok Sabha on August 30, 2012. Instances of violent agitations at automobile plants, lockouts at pharmaceutical units and a case of a jute mill chief executive beaten to death in West Bengal are some other pieces of news related to labour unrest in the recent past. The fractured worker-management relationship can be assessed from a 2011 report on industrial disputes, closures, retrenchments and lay-offs, released by the government in March 2014. The report said in 2011, India recorded 370 industrial disputes (strikes and lockouts), leading to loss of wages amounting to Rs 48 crore and production loss worth Rs 422 crore. As the National Democratic Alliance government plans to overhaul age-old labour laws, the need of the hour is a balancing act between labour rights and corporate welfare. Recently, the Union Cabinet approved proposals to amend three labour laws - the Factories Act, 1948; the Apprentices Act, 1961; and the Labour Laws (exemption from furnishing returns and maintaining registers by certain establishments) Act, 1988. Allowing women to work in night shifts, increased penalties for violation of law, relaxation of norms for apprenticeships and easing the procedure for filing returns in small industries are some of the other proposed changes. However, in a maze of about 100 existing labour laws, the proposed amendments are of little significance. Currently, the two most contentious Acts related to labour are the Industrial Disputes Act, 1947; and the Contract Labour (Regulation and Abolition) Act, 1970. The disputes Act stipulates if the number of workers in a unit is at least 100, the government's prior approval is necessary for retrenchment. During an economic slowdown, employing workers on regular payroll turns out to be a major financial constraint. Also, securing the government's permission for retrenchment is difficult. In 2011, 89 industrial units were shut, against 42 in 2010. And, financial stringency accounted for the highest number of closures at 40 per cent. Indiscipline accounted for most of the 370 industrial disputes in 2011 (30 per cent). "The present labour laws are more anti-labour than reform-oriented. Today, employers cannot take any disciplinary action against workers. As a result of the provisions of the Act, of the labour force of 490 million in India, only 29 million (including 18 million in the government sector), are regular employees. For protecting the rights of just six per cent of the workforce, the law is doing bigger harm," says N G Khaitan, partner in law firm Khaitan and Co. The Contract Labour (Regulation and Abolition) Act, 1970, has led to many disputes related to discrepancy over wages between contract and regular labourers. In 2011, wages and allowances accounted for 24.9 per cent of industrial disputes and involved the highest number of workers. In 2008, a consultative committee of the labour ministry said low wages, long hours, and lack of amenities were some issues the Act didn't address. According to a survey by the Indian Staffing Federation, about half the contract workers in reputed firms received an average salary of Rs 5,000-10,000 a month, lower than the average salary of regular workers. Moreover, the contract workers weren't covered under any social security scheme. As most labour laws are in the Concurrent List, states are free to amend these. In a landmark move, the Rajasthan government recently amended four key labour laws-the Industrial Disputes Act, the Factories Act, the Contract Labour Act and the Apprentices Act. One of the key amendments in the Industrial Act was stating only units with at least 300 workers would need government approval for retrenchment. The state also increased the percentage of workers needed for registration as a representative union from 15 per cent to 30 per cent. It is expected the Central government will emulate its Rajasthan counterpart on changes in labour laws. "About 60 per cent of factories in India employ 1-30 workers. So, with the amended law in Rajasthan, a large number of workers can be employed as regular workers," says Khaitan. States such as West Bengal are, however, sticking to old laws. For instance, even when the Centre amended the Industrial Disputes Act to ensure only units with at least 100 workers needed government approval for retrenchment, the West Bengal government retained the number at 50. 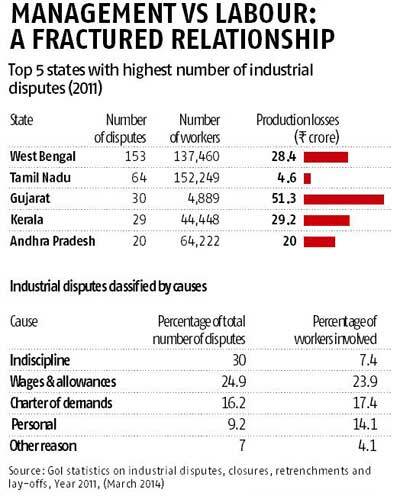 In 2011, the state accounted for the highest number of industrial disputes-153 out of 370. Tamil Nadu, Kerala and Gujarat followed. Industrialised states have taken various steps to introduce changes in contentious labour laws, but these have been sector-specific. For example, in 2004, the Gujarat government amended the Industrial Disputes Act, exempting special economic zones from government permission to lay off employees. Similarly, Andhra Pradesh and Goa have amended the Contract Labour Act, prohibiting contract labour in core activities. The proposal to overhaul labour laws has seen its share criticism. Unsurprisingly, the biggest opposition comes from labour unions. But what surprises many is the Bharatiya Mazdoor Sangh, or BMS, (the trade union arm of the Bharatiya Janata Party), too, is livid with the reforms. "We strongly oppose the Rajasthan government's proposal to amend labour laws," says BMS president Baij Nath Rai. Gopal Krishna, an activist of the Toxic Watch Alliance, says the proposed amendments in the Factories Act do away with the first schedule, which lists of hazardous substances used in various processes. While the Bill says the intention is to widen the scope of hazardous substances, there is ambiguity on this matter. "Factories employing up to 19 workers will not have legally binding responsibility for the safety of their workers inside the factory. The amendment also undermines the legal protection on work hours, a weekly off and other rights to decent working conditions," says Krishna. 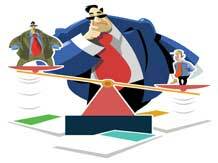 An equitable overhaul in labour laws, it seems, is easier said than done.